Orientalism – the idea that the standpoint of Western writers on the East greatly affected what they wrote about the East, the "Other" – applied also in Russia and the Soviet Union, where the study of the many exotic peoples incorporated into the Russian Empire, often in quite late imperial times, became a major academic industry, where, as in the West, the standpoint of writers greatly affected what they wrote. Russian/Soviet orientalism had a particularly important impact in Central Asia, where in early Soviet times new republics, later states, were created, often based on the distorted perceptions of scholars in St Petersburg and Moscow, and often cutting across previously existing political and cultural boundaries. 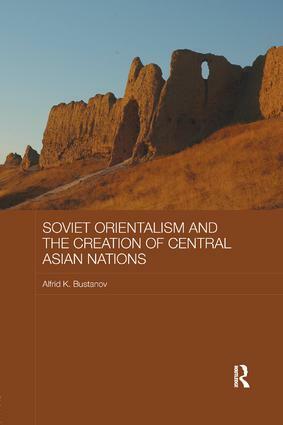 The book explores how the Soviet orientalism academic industry influenced the creation of Central Asian nations. It discusses the content of oriental sources and discourses, considers the differences between scholars working in St Petersburg and Moscow and those working more locally in Central Asia, providing a rich picture of academic politics, and shows how academic cultural classification cemented political boundaries, often in unhelpful ways.